If there is such a thing as a “typical day,” Mark Land hasn’t had one in his seven months or so as IU’s associate vice president of university communications. Land formerly was corporate communications director at Cummins, Inc., in Columbus, Ind., a job he took in 2003 after many years as a reporter or editor at several newspapers. He is a 1985 graduate of Indiana University, where he majored in journalism and worked at the Indiana Daily Student. He oversees IU Communications, an integrated group that provides services to IU units and departments who need to get their news and information out to the public. A recent rebranding effort is aimed at unifying the messages that come from IU. Land also deals with media requests, provides support to the president’s office and often is spokesman for IU when news breaks. “We try to be proactive instead of reactive, to get out in front of news instead of caught by it,” he said. 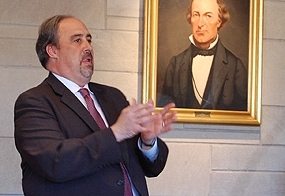 Land said being the spokesman for IU – and all the work that entails – is the only job that could have lured him away from his career at Cummins. BPC president Jim Bright also welcomed Bloomington Mayor Mark Kruzan and state representative John Gregg, a gubernatorial candidate, as well as members’ guests and several IU journalism students. The next meeting is March 26, when IU assistant professor Hans Ibold and some of his students will recount their spring break trip to the South by Southwest interactive conference in Austin, Texas. This entry was posted on Friday, March 2nd, 2012 at 5:15 pm and is filed under Guest speakers. You can follow any responses to this entry through the RSS 2.0 feed. Both comments and pings are currently closed.